"The Most Secret Place On Earth Tour" - 8 days - USD$ 2,395 (60% trails) (all inclusive). 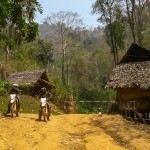 On one of our Laos motorcycle tours, away from the big cities, it feels like its 30 years back in time versus Thailand. 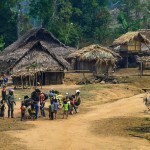 You will experience a much more rural feel on a Laos motorcycle tour, there are less than 7 million people in Laos versus Thailand’s 67 million population. 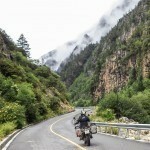 So why pick a Laos motorbike tour? 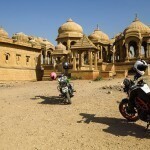 This country is still very untouched since the Vietnam War era, on one of our motorcycling adventure tours you can still experience ethnical tribal cultures that date back 1,000’s of years, it's becoming harder and harder to find. The U.S's most secret CIA base that never existed. So secret in fact, it wasn't on any Laos maps! During the Vietnam War this was the busiest airport landing strip in the world & no-one even knew it existed - "LS 20 A" (Alternate). 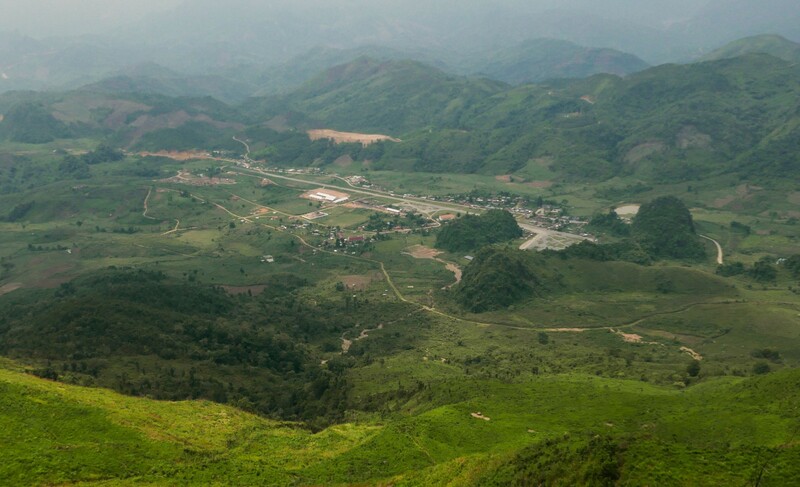 Nestled between mountains on 3 sides, it had been a restricted no go area to the general public for 30 years, but now has been opened up & gives a great opportunity for inclusion in a dirt tour in Laos. The first day we will make our way south east on tarmac towards the Laos border, probably spending the night in Uttaradit or Loei. Beautiful curvy roads headed this way, it will give you a good introduction to the bike. We will ride to the International border crossing and clear into Laos spending the night in Laos capital, Vientiane which is on the Mekong River. 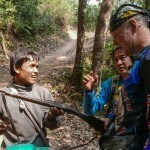 We will ride north, through rural Laos villages and end up at the secret CIA base in Long Cheng, Laos. There are several restaurants in town and a guest house. 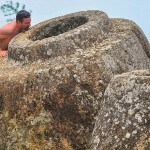 Mountain pass trails all the way to the town of Phonsavan, famous for its ancient “Plain of Jars”. 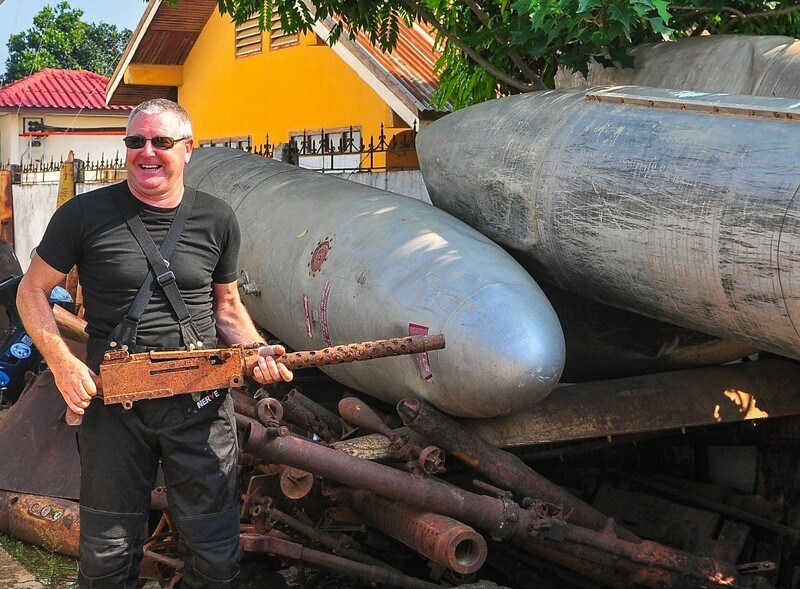 Lots of Vietnam War memorabilia around Phonsavan that we can visit. Easy trails all the way across to Luang Prabang with a few shallow river crossings thrown in, a delightful day’s riding. Everyone loves the town of Luang Prabang. It’s french influence is still very visible today. Stunning waterfalls and historic temples, this is the perfect place for a rest day. We take the ferry across the Mekong River & then ride a mountain trail all the way to the Laos/ Thai border where we will spend the night. An opportunity for some interesting morning market photography in Hongsa. 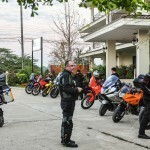 A short ride to the international border crossing with Thailand. 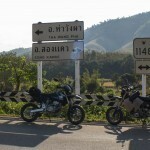 From there, we will take some delightful tarmac roads back to Chiang Mai, its a full day’s ride. 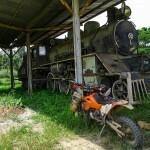 On a Laos motorcycle tour, you will most likely see this. Tractor trailers often get out of control here. 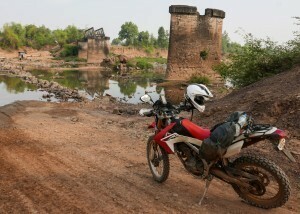 On one of our Laos motorcycle tours, you’ll see a bit of Thailand and a lot of Laos. 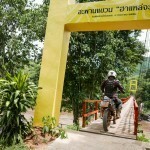 This Laos motorcycle tour takes you to what might be the most special place in Laos.